This application protocol describes the flow cytometric analysis of regulatory T cells (Tregs) after spleen dissociation from healthy C57BL/6 mice. Viable single cells from mouse spleens are easily obtained by tissue dissociation using our gentleMACS™ Technology. 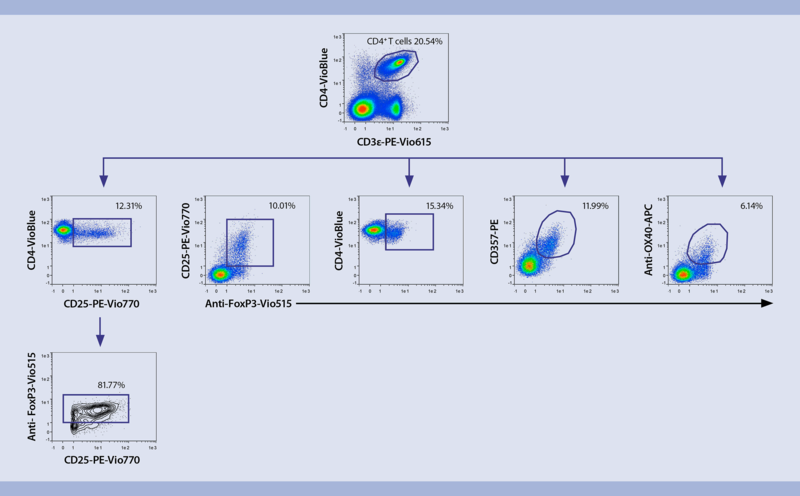 For downstream flow cytometric analysis of Tregs, we have designed a validated multicolor flow cytometry panel, using our REAfinity™ Recombinant Antibodies and Viobility™ Fixable Dyes. In addition, we provide an optimized gating strategy for the analysis of Tregs from mouse spleen. This enables the efficient phenotyping of Tregs within the population of CD4+ T cells. The required total buffer volumes should be calculated beforehand; volumes will depend on the number of cells to be analyzed as well as the number of tests to be performed (for more information, please refer to the Anti-FoxP3 antibodies data sheet). Prepare Fixation/Permeabilization Solution by diluting 1:4 the Fixation/Permeabilization Solution 1 with the Fixation/Permeabilization Solution 2, (i.e. for 10⁶ cells use 0.25 mL of Fixation/Permeabilization Solution 1 plus 0.75 mL of Fixation/Permeabilization Solution 2). Prepare a 1× solution of Permeabilization Buffer by diluting the 10× Permeabilization Buffer with deionized or distilled water. ▲ Note: Before dilution make sure that buffer does not contain any precipitates. Proceed with surface and intracellular staining. Always prepare reagents freshly. Failure to do so may lead to sub-optimal results. Resuspend cells in 1 mL of cold, freshly prepared Fixation/Permeabilization Solution. Wash cells by adding 1 mL of cold buffer per 10 cells and centrifuge at 300×g for 5 minutes at 4 °C. Aspirate supernatant completely. Wash cells by adding 1 mL of cold 1× Permeabilization Buffer and centrifuge at 300×g for 5 minutes at 4 °C. Aspirate supernatant completely. Resuspend cells in 1× Permeabilization Buffer and add the corresponding volume of the Anti-FoxP3 antibody according to the data sheet. Resuspend cells in an appropriate volume of 1× Permeabilization Buffer Buffer and proceed to flow cytometry analysis. Gating strategy showing the analysis of regulatory T cells (Tregs) from mouse spleen. Splenocytes from C57BL/6 mice were stained using the described antibody panel to analyze Tregs. Tregs represent a small population of CD4+ T cells, that characteristically express high surface levels of interleukin-2 receptor (IL-2R) alpha chain (CD25), GITR (CD357), and OX40 (CD134); and the transcription factor forkhead/winged-helix transcriptional regulator (FoxP3). Splenocytes from C57BL/6 mice were stained using the described antibody panel to analyze Tregs. Tregs represent a small population of CD4+ T cells, that characteristically express high surface levels of interleukin-2 receptor (IL-2R) alpha chain (CD25), GITR (CD357), and OX40 (CD134); and the transcription factor forkhead/winged-helix transcriptional regulator (FoxP3).